HP’s AMD Chromebooks Now Available. Shipping Next Week. HP didn’t waste any time on bringing their latest Chrome device to market and for that reason, they are truly the world’s first AMD-powered Chromebook. The product page for the HP Chromebook 14 is now live and you can get your hands on one as early as next week if you so desire. Acer joined the fray as well with their own AMD Chrome OS offering but it wont be available until next month, at the earliest. Internally, the Acer and HP are practically the same. The one for you really depends on personal preference. You can see a closer look of the Chromebook 315 (AMD) here and you’ll see it brings many of the familiar features that have become mainstays on Acer’s 15.6″ lineup. I tend to lean towards the HP for a number of reasons. One, my first Chromebook was an 3G-enabled HP 14 and the Snow White AMD model is very reminiscent of that device. Two, I recently procured the HP Chromebook x360 14 and I find that a 14″ Chromebook just feels more manageable. There’s a lot of benefit to Acer’s 15.6″ devices but as someone on the go all the time, the 14-inch models seem more portable. Anyway, that’s just me. On to the details of the HP Chromebook 14 AMD. 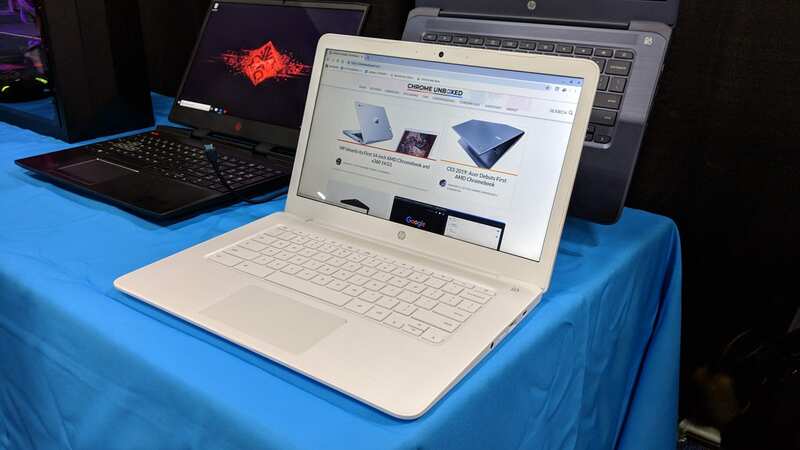 At the CES preview, HP had a couple of configurations available for us to handle including the A4 and A6 AMD processors and touch-display versions of the Chromebook 14. For now, HP has gotten the ball rolling with the base-level device that comes with the AMD A4-9120 APU and a non-touch 1366×768 display. That may not sound impressive but let’s not forget, it’s only $269.99. AMD’s entry into the Chrome OS space opens a lot of new doors as Linux becomes more comfortable on Chromebooks. GPU support is still a work in progress but the ability to leverage AMD’s graphic-centric nature could expand Chrome OS’s potential ten-fold. These entry-level AMD Chromebooks from HP and Acer won’t be the gaming or developer platform of the future but the low cost and competitive performance will likely make them a consumer favorite in 2019. You can order the Snow White or Chalkboard Grey HP Chromebook 14 AMD at the link below.